North Korea has a long history of desiring to run its own affairs, without interference. It also has a long history of wanting to protect itself with WMDs (Weapons of Mass Destruction). 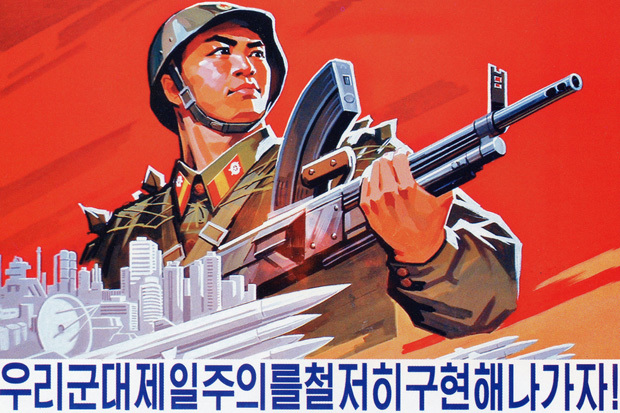 This North Korean propaganda piece demonstrates the significant faith the country places in its military might. Image online, via Wired.UK. Today, North Korea possesses nuclear weapons. That fact alone has heightened tensions between the DPRK and the United Nations. Some of those nuclear weapons are capable of reaching Alaska. That fact alone has increased the rhetoric between the United States and North Korea. Experts believe that North Korea has uranium-enrichment capability to complement the country's already existing mining and milling facilities plus its missile production sites. Laboratories developing, and plants producing, chemical and biological weapons of mass destruction are also known to exist. The inability of the two sides to resolve their differences has meant that the two Koreas and their allies have had to remain on a war footing along the inter-Korean border ever since. Fifty years after the North Korean invasion, Communist and United Nations soldiers still glare at each other across the demilitarized zone established in July 1953. But North Korea's reliance on itself to produce weapons of mass destruction are rooted in the political philosophy of Kim Il Sung, the now-deceased ruler whom the people still call their "Great Leader." Bos, Carole "NUCLEAR WEAPONS" AwesomeStories.com. Jun 01, 2008. Apr 23, 2019.